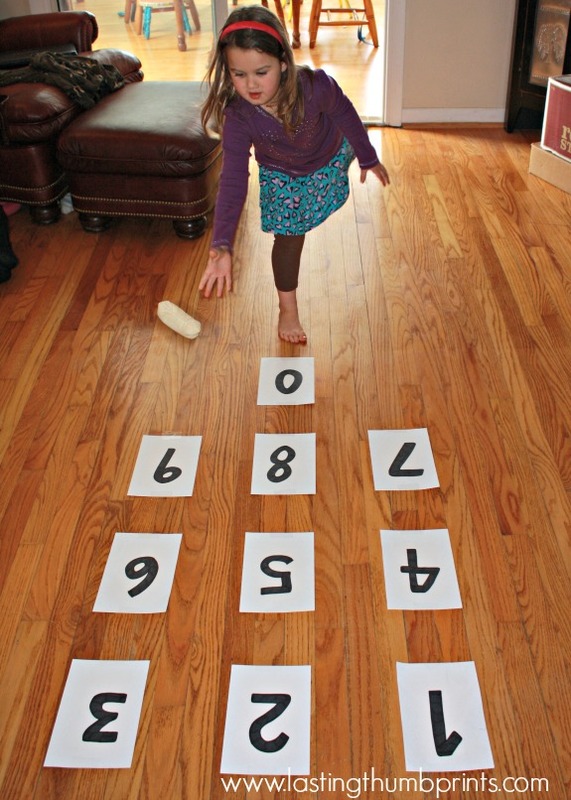 Last week I shared a fun game to help teach children their phone number. It ended up being put to use in a variety of ways in our home 🙂 but it really helped my five year old daughter learn my cell phone number quickly. We did quite a few other activities throughout the week and now she has it memorized. We’ll continue to review the number periodically to make sure no one forgets! We also worked on learning our new address. Since we moved recently, our seven year old son joined in the action. I’m preparing to begin a Geography/Earth Science unit, A Child’s Geography, with all of my school aged children, so this actually tied in nicely to begin. I used the book Me on the Map to help introduce the idea of our own place in this big world. While learning both my phone number and our address, I didn’t want to solely rely on worksheets for practice. And I needed some ways to make the repetition more memorable and fun. Not just making my children listen to me repeat each one again and again and again. So here’s a quick look at some of what we did. 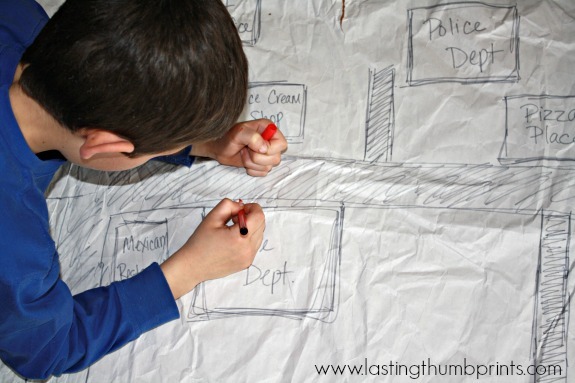 We drew a map of our home and town on old packing paper – please excuse the wrinkles. This one was little bit harder to keep accurate for us since we moved to a more rural location outside of our small town. Let’s just say it wasn’t quite drawn to scale, but it served it’s purpose. 😉 We wrote the house number on the drawing of our home, added the street name on our road, and placed the name on our town. In addition to mapping out important locations like the fire department, the children included their favorite places to eat. It’s so much easier to memorize something to song. If you do a quick search on the internet you will come up with a variety of ideas, but you can also easily make one up on your own. 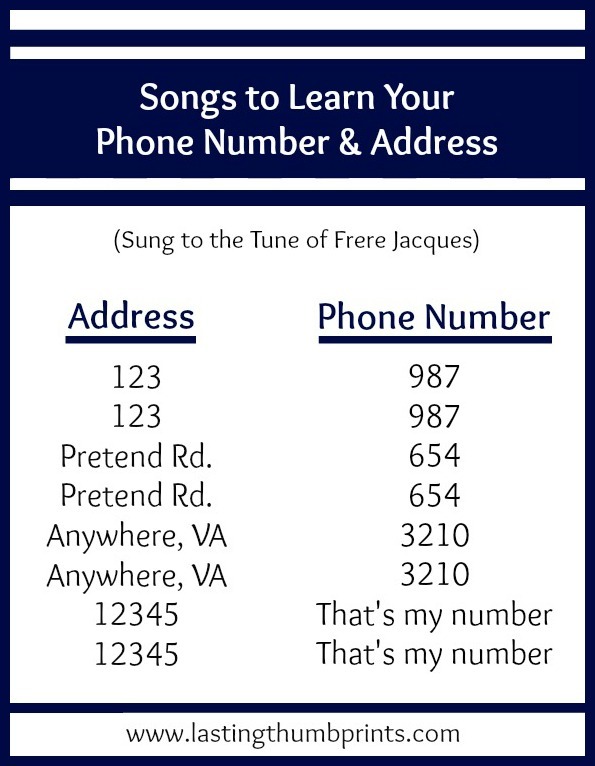 We sing our phone number and address to the tune of Frere Jacques. Super easy! I’m planning to make a telephone file folder game to review the number with this free learning telephone numbers printable from Spell Outloud. I will use the printable that includes the area code, laminate the numbers, and use velcro dots so we can reuse it. Let your child practice dialing your phone number on a real phone. This is also a great time to give instruction on how to place a call on a cell phone since it’s a bit different than a landline. The kids loved this activity! 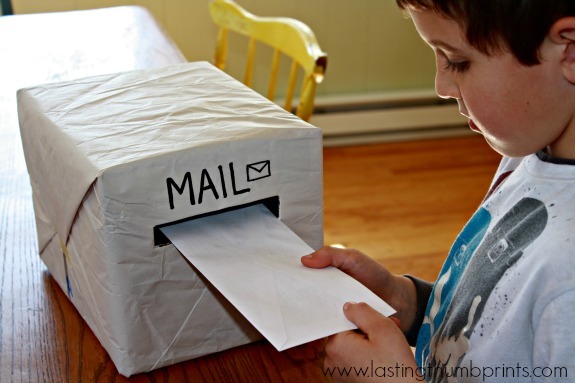 I recycled an empty box and packing paper into a family “mailbox”. The children wrote letters and drew pictures to each other. They put our address on envelopes and stuck them in the box. This might turn into a long term family project! If you don’t feel like making your own mailbox, I think this Melissa & Doug play mailbox is cute! We made houses out of empty cereal boxes with our house number on them. We also made street signs to go with it. I think next time we’ll try making houses out of brown paper bags. 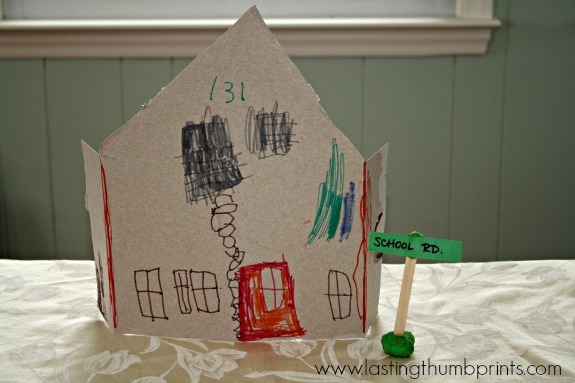 For a phone number craft, you could cut a telephone out of construction paper, have children glue on numbers, and then practice dialing their number. We played this fun game to learn our phone number last week. We’ll make the grid with chalk outside and play this game for review as the weather warms up. This week I’m going to try reviewing my cell phone number by creating a phone BINGO game. 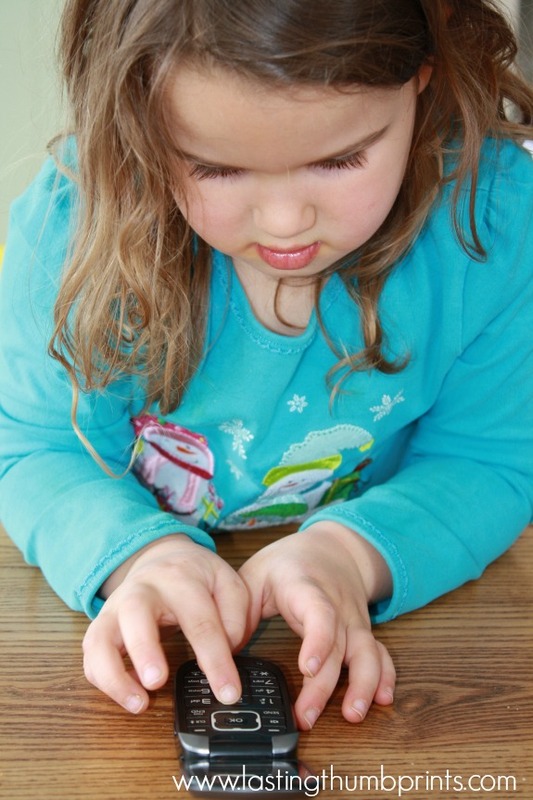 Adding games to the learning process makes things more enjoyable for all of us. This was a really fun week of learning and I feel so much better knowing the kids are safer because they have learned this important information. 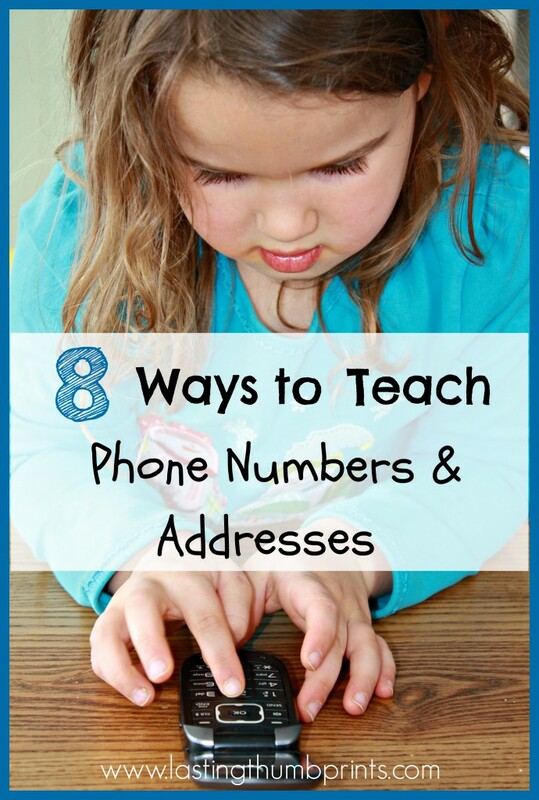 How do you teach phone numbers and addresses? Have any fun tips to add? This is great! I’ve been thinking its probably time to start teaching my 3 year old some of these things! These are great ideas! My favorite is singing the address and phone number to Frere Jacques. I’ll have to do that with my 3 and 4 year olds. Thank you,so helpful! My four and eight year old loved making the neighborhood map! 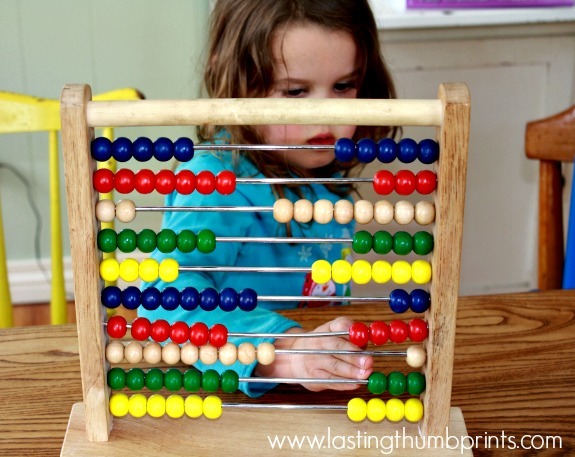 Very very helpful information I’m a homeschooling mom of boys their attention span is short we do many learning games and some of these things are very helpful. Super ideas! Thanks so much. Will be doing these at home this week with my 5 yr old. Thank you! I am going to try the song idea! !